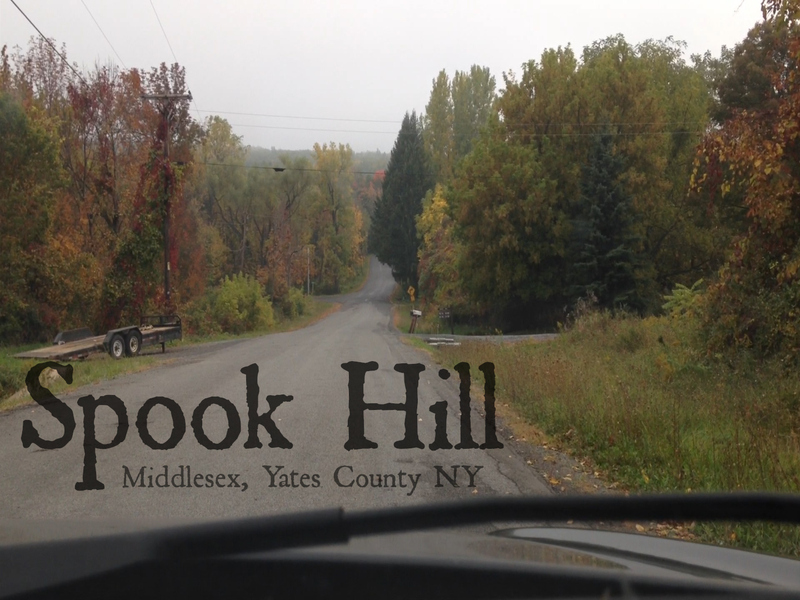 I’ve always wanted to check out Spook Hill in Middlesex, on the western side of Yates County near Canandaigua Lake. This is in the Central Part of the Finger Lakes region. And what better time to explore Spook Hill and the Finger Lakes than October? Am I right? Legend has it that if you put your car in neutral at a certain spot on Newell Road in Middlesex, Native American spirits (whose bodies are buried near by) will push your car back up the hill. Well, yes there is a Native American burial ground near by – just down the road on the hair pin turn on North Vine Valley Rd near the lake. To ensure you are completely creeped out as your read this post and watch the video I made, you should know that about 100 years ago, a gentleman unearthed (er, dug in to) a Native American who was sitting halfway up with a pipe in his hand (source! – this is legit!). The Vine Valley Burial Ground is 1.4 miles down the South Vine Valley and South Lake Roads from Newell Road. A more probable explanation, if Native American spirits don’t seem realistic, is that Spook Hill is an optical illusion. You’re going up, up, and up this big hill, and you come up to a peak… and then down. Like a crest, or a knoll (Watch the video to see what I mean). And so when you get over that knoll a bit, and put your car in neutral, you would expect to continue to coast “down” the hill. So — here is our exploration of Spook Hill in Middlesex. Let me know what you think the explaination is for this phenomenon in the comments. I’d love to hear about your experiences here. If you decide to experience this phenomenon yourself, I advise you to read this post first as there are some safety considerations and this one for more info and exact coordinates of the phenomenon. Spook Hill is one of those places in the Finger Lakes that you might hear about growing up, but never go check it out yourself. I recommend doing it! Don’t wait until October, you can spook yourself and your family out any time of the year. You are not even in the right place to test it. You DON’T roll backwards “up the hill.” You roll forwards in a place that only looked like it was up hill based on the appearance of the banks on both sides. There used to be an old abandon house on the right where you put it in neutral. Since the 1980’s the town of Middlesex has regraded the road and I have been told it does not work anymore. But I could go check some day. According to http://www.waymarking.com/waymarks/WMGKXC_Spook_Hill_Middlesex_NY we were in the right spot. We went by the coordinates there. I had heard that it used to work better, especially before the road was paved. But it does work now (at least it did a little over a week ago when I shot the video). Please go check out for yourself. Let me know if you find any different results. Many trips to this very interesting place, first trip Mom and Dad took us and a bike with out a chain in the late 70’s that was very cool for a bunch of kids we all tried and it did what you had shown in your video. We are now a small Ghost group that have exsperienced some amazing things. We ghost searched the school house that has been moved from Newell rd to the end down twords the lake. We are just trying to get answers for people that are experiencing things in their house or property. Some amazing footage from Rushville also. Alot of history to be discovered. Creepy whatever the case may be- I can’t wait to take a fall drive and show my family!! :) Thank you! You’re welcome! I just added a paragraph to the end of the post with where to find more info and exact coordinates. There may be a lot of magnetic iron ore near the crest of the hill “pulling” the metal car towards the ore.
As teenagers back in the 70’s we used to go to spook hill and then it really did work…just like the article says….car in neutral and the care would go backwards. Thanks for the memory! I was raised only minutes from here and this indeed did happen to all of us who tried it back in the 80’s. At first I hear 2 clicks…probably going from drive to reverse. And later on I hear one click…. probably from neutral to reverse. Would I fake a video of something that you can go experience for yourself? Don’t be silly. It works the way it was described to. We’ve been doing it since the 60’s, and if those old tanks could roll up the hill, you can certainly do so in todays’ plastic vehicles. We used to go there in the late 70s and early 80s and party in the run down abandoned house that was rumored that a man killed his wife in. I don’t know if there was any truth to it but it made for some fun nights. Also the TV show PM Magazine did a story on it back some time in the early 80s. Does anyone remember that? Awesome video—“spot on”–just wish you would have explained what was happening more. Been going there for years–love it more everytime. it. was. creepy! Soo cool though! Got to check it out! Just a factual comment. The spot is in Western Yates County, not Eastern. Although I never was able to try this, I had several fiends who did so successfully back in the 70s. I too was under the impression that the car traveled uphill (going forward) in neutral. Aah! I didn’t realize I had said “Eastern” in the voice over. Thank you for letting me know – I added a notation to the video as a correction. Thanks Amy. Spook Hill is actually an optical illusion. My husband, being a city slicker construction man, didn’t believe it and we had to go back home for his big level. We went back and sure enough when he put it down he laughed and told me to get out and start walking uphill. I did, but it actually felt more like downhill, and so it was, according to his level. Walking in the opposite direction took more effort because even though it looked like I was going down, I was actually fighting gravity and going uphill! It all has to do with the slant of the hill alongside that road making everything look oppposite. Go and try it four yourselves. It may be true and it may not be true….but for us who have been there and experienced it and felt the awe that came with it….thanks for the science lesson. We do not really care why or how it happens…we love the stories and the wonder of it all. It is you realists who try to ruin it for everyone else….did you never let your imagination run or were you not allowed to let your imagination run? But thanks for ruining the wonder for those of us who don’t give a hoot how it happens….just that it does. I have been there many times. I loved going there and hope to take my children and grandchildren there someday too. There was something like this on a show called Fact or Fake. I forgot where the location was but there was a legend that on a hill a school bus full with children was hit by a train while they were going over tracks and they were all killed. If you put your car in neutral legend has it that the kids would push your car uphill over the tracks. Turns out that it was a optical illusion and even though everything looked like it was all uphill everything was really going down hill. I do think this is really cool though and a great way to scare yourself and others! That’s the first I’ve heard of the school bus legend. Just wanted to point out that is a movie you are actually talking about. Movie was called Fingerprints I believe. The legend is actually from San Antonio and is what the movie, Danielle mentioned, is based on. It is based on the school bus full of children being hit by a train and everyone killed. They say the several streets nearby are named after the children that died but there are no lingering Articles archived to ever prove that such an horrific accident took place. The pushing of the vehicles off the tracks is an optical illusion though. There was a documentary done that shows it is a decline angle although it looks slightly up hill. I am from an area near spook hill and never tried it myself but I am most certain it is probably the same situation. I went there the first time when I was maybe 14 years old after midnight, it was the craziest experience and one of the most spookiest. Did it stop me from returning again and again “NO” At that time I didn’t know too much of spiritual events so I thought there had to a LOGICAL explanation so, I asked my Earth Science teacher who said quite possibly the gravitational pull is real strong right there. I didn’t buy it. So glad that a lot more people have had the experience and Im not alone now after all these years I believe it has something to do with the spirit world, but have yet to figure out why there? back in 1963 we had a cottage on Honeoye lake and Our friends had property on canandaigua lake. They took us to “spook hill” and it really did move a bit faster but backwards we rolled. I have taken My grand children and other friends there in the last few yrs and YES is still works. I now live in Rushville and would love to know more about that as well. I have only recently moved to Middlesex didn’t know about this…. will certainly check it out. There is a “spook hill” in Florida and I have been there and experienced the same thing…only it looked like you were climbing the hill but instead you were going down hill. They said it was an optical illusion. Can’t wait to test this one! Went to college in Canandaigua in 1974. Was a Spook Hill regular. Great place to get stoned and freak yourself out! Have gone there for years, worked with the dirt road, works with a paved road, and we even put a soccer ball on the road and that rolled up as well. Yup, I remember doing this as a young teenager in the early 1970’s. Grew up in Newark, New York. Is this right at the intersection? I have tried to find it before seeing your video and couldn’t. Thanks for posting it!! And to Jerry- who said he’s got some footage of Rushville…. I live in an 1860 home in the v village that is support spooky. Would love to see what you have found in this town! Please contact me at ericaiversen@ gmail.com. It’s not really at an intersection at all. Was a great place to go when growing up! Many Indian legends in the area! !